I do not always choose the books I review. Sometimes I am able to request specific titles from publishers but other times titles arrive unannounced. This provides me with the opportunity to review books that I would not, under most other circumstances, read. 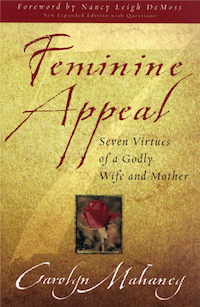 Such is the case with Feminine Appeal, written by Carolyn Mahaney. I left the book in my shelf for several weeks before I dared to open it up. I was gratified to see that it was endorsed by many men far more godly (and masculine) than myself, so if someone is going to laugh at me for reading it, they will also have to mock John Piper, Josh Harris, Mark Dever, Wayne Grudem, Dennis Rainey and Randy Alcorn. I feel that I am in good company, and so much so that I can even admit that I found the book tremendously enjoyable. Each of these topics receives a single chapter in the book which concludes with a reflection on Mahaney’s own mother, Margaret, who evidenced so many of these graces. Appended to the book is a study guide prepared by Nicole Mahaney Whitacre, daughter of C.J. and Carolyn. There were at least two aspects of this book that stood out to me. First, in a book of this type it is always easy for an author to present herself as the example of all that is good and worthy. It is easy for an author to show how she has overcome the difficulties of life and now exemplifies the virtues of godliness. This is particularly prevalent in certain areas of the Christian world where Christian writers, speakers and singers feel they need to display the evidences of a type of anointing that transcends what the rest of us experience. I was glad to see that Mahaney is honest and humble. She humbly admits her own faults and her own shortcomings. She does not hold herself as the example of all that is good. At the same time she does not heap scorn upon herself. She is honest with those areas in which she has, by the power of the Holy Spirit, grown and developed. Yet she is also more than willing to admit where she still struggles and where her sinfulness has affected herself and her family. The second aspect of this book that stood out to me was how closely Carolyn’s life and ministry parallels that of her husband. The final words of the book could just as easily have been drawn from C.J.’s later book, Humility. Carolyn writes of her mother, “Although it’s true, by worldly standards, that Margaret never accomplished anything great, in God’s eyes she has achieved true greatness. Her life can be summed up by the words of our Lord: ‘Whoever would be great among you must be your servant…even as the Son of Man came not to be served but to serve, and to give his life as a ransom for many’ (Matt. 20:26,28).” This tells me that Carolyn and C.J. are not merely building a facade – a fictitious persona which they present to the public while in private they are far different. It is clear that they truly do walk together and minister to each other. It is clear that they first apply what they learn to their own lives before sharing with others. This book was a valuable read, even to one who has no feminine appeal! As I read I was challenged in the ways I understand my wife and was provided with much wisdom which I can share with her and even apply to my own life. I was given a greater appreciation for the precious gift God has given me in Aileen. I give this book my unreserved recommendation for men or women.